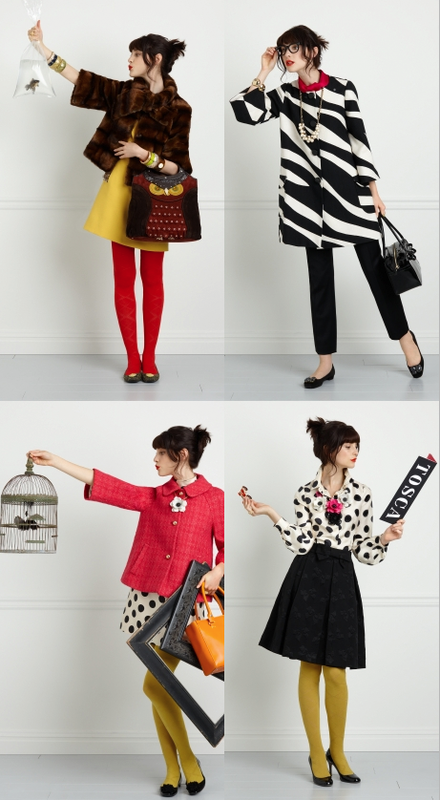 As much as I like the new Kate Spade clothing line I love the styling even more. Hooray for bright tights and birdcages! it's funny, I don't really buy Kate Spade in general but I always love her ad campaigns. The styling is to die. I totally agree…if I could afford Kate Spade I would definitely pick up some of the items they just came out with. Thanks for sharing such inspiring pictures. Oh and by the way…my sister and I are hosting a fabulous giveaway on our blog until Thursday…we would love it if you stopped by and entered for a chance to win! I love it! I have a huge drawer of colorful tights, bring on fall! oh I love the styling! Yes, adorable. Speaking of which, does anyone know whether Harvey Faircloth is still launching later this month or next? What a coincidence! I posted about Kate Spade today as well. I am adoring the fall line!! the model is very zooey deschenel, no? love it! Okay, i am in love! fabulous styling, fabulous! I must have the owl bag! Anyone know why it is not on the Kate Spade website? the owl bag will be available later in the fall, fear not! I love the mix of classic silhouettes with funky bold patterns and colors. Wish I could afford that b&w coat! was just in the kate spade store in nyc and the clothing is selling out!! !the adorable salesgirl told me that they are down to just a few pieces of each! so cute!! !